Learning how to code starts with sifting through massive amounts of information, on where to start. After which, you’re faced with deciding what to start learning. Code Academy: initial point of contact. C<>de School; For more advanced newbies. As a newbie, your learning should be focused, guided and cover core concepts. A topic must be learnt by practicing – by doing coding examples. Googling can either be helpful or tedious , depending on how much you delve into a certain topic . Avoid spending too much time on a certain topic because it will detract from the bigger picture. 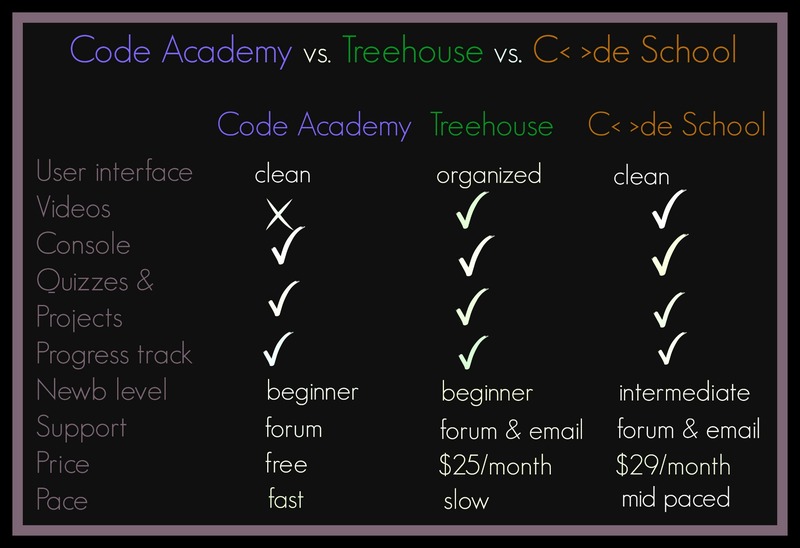 In my opinion, it’s well worth starting at Code Academy, following on to Treehouse and then C< > de School once you start advancing. I also recommend a textbook/ebook on what you’re learning and taking notes. I started out with this first. when I knew nothing about coding. Nothing, Nada, Zilch. However, I did know that HTML & CSS is a prerequisite to any kind of programming. If you didn’t know this, now you do! As a newbie, no matter what your end goal is start at HTML & CSS first. Code Academy is free, which is usually why it’s an initial point of contact with coding, for a lot of people. I particularly liked the clean minimalistic dashboard at Code Academy, they recently changed it and it’s very nice. Despite not having any videos, their teaching text is engaging and to the point. Each course is written by a different instructor so you don’t get bored or inundated with the same teaching style. Additionally the code exercises build on top of each other and become harder as you progress. Users collect badges as they complete assignments.They also have projects you can do like building your webpage. The problem is that sometimes you need to keep refreshing your page, or restart firefox after clearing cookies when code doesn’t work due to bugs. People also complain that Code Academy gives them a false sense of security, because of all the hints and leading the learner by the finger. These are valid issues, but not applicable to a newbie. As a newbie, Code Academy should be your initial contact with coding, and not your only contact! This is a popular coding platform that promises to prepare you for a career in programming. I haven’t been using this one for very long and go there to tinker around. Their basic membership starts $29./month, but you can try it free for 14 days.They have a broader variety of courses than Code Academy and Code School, with business modules included in addition to programming classes and a library, with tons of resources. 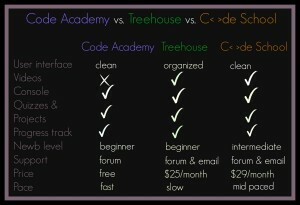 Treehouse offers a more structured environment and is program orientated. Their user panel is a little more crowded but organized. Newbies are guided by course “tracks”. For example depending on what your goals are, they offer course tracks such as web development, Ruby on Rails, IOS development, web design etc. You choose a track and then videos, quizzes and exercises precede. Once you choose a track, you’re guided step by step through the courses and cannot jump courses (must do them chronologically). Treehouse tracks progress, through a point and badge system as you work through quizzes and code challenges on a work-space. They also have a job board which is pretty cool. For slightly more advanced beginners. This is a paid subscription starting at $25/month. But here is a free 2 day pass! Head here if you’re in need of more practice, their rails class is highly rated. Simple interface, not too much going on here all at once, which is nice. They have fewer course tracks, but classes on lesser known topics like GitHub and the very new Node.JS are included, which is exciting! I jumped into their instructional class on Git, which has about 25 slides with accompanying exercises to help you learn how to use the Git repository. Like Treehouse, instructional videos are used. Followed by coding exercises. You can also download slides of the video if you wish to. As a personal preference, the console is built into the web page like Code Academy, I just find this more convenient than having to open a separate workspace (like Treehouse). Progress is tracked through a badge system. These are shown in a report card on the user panel. Hello World! & newbies!I write about programming concepts, apps & general tech. Previous PostCHANTELL OSEJO: FINDING HAPPINESS AS A WOMAN IN TECHNext PostShould You Apply to the Ada Developer’s Academy?